As one of the oldest known fairy tale collections ever Stories from the Pentamerone influenced several famous storytellers, including the Brothers Grimm stories. Known in the Italian as Lo cunto de li cunti overo lo trattenemiento de peccerille (The Tale of Tales or Entertainment for Little Ones), the Pentamerone is one of the most influential literature works in the fairy tale genre today. 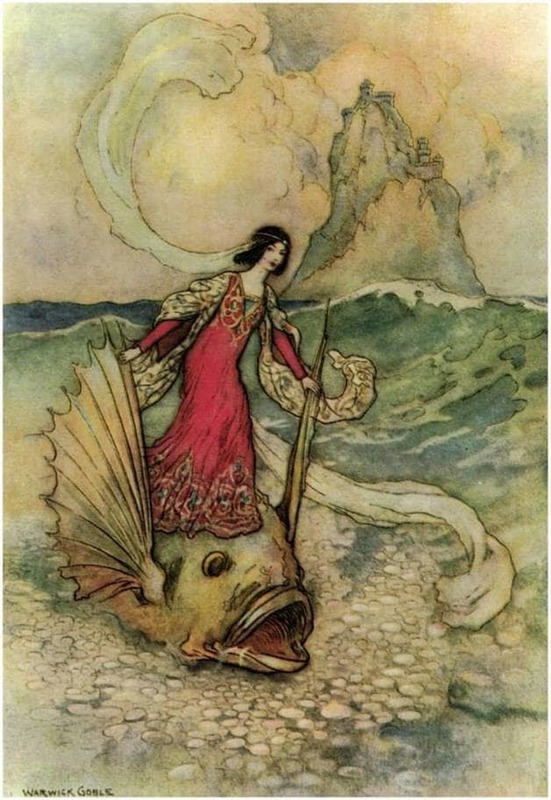 “Rita riding on the dolphin.” Illustration by Warwick Goble, published in Stories from the Pentamerone (1911), Macmillan and Company. Readers of the collection will recognize several of the stories as variants of beloved Grimm stories such as Sleeping Beauty and Cinderella. Like the stories of A 1001 Nights, Stories from the Pentamerone uses a framing device of a story-within-a-story. The stories are related over five days by Princess Zoza, who is entertaining an evil Queen who stole Zoza’s husband. The introduction, “How the Tales Came to be Told,” sets the scene for the reader, and “Conclusion” is the end of the overall collection, bringing a incident in the first story to a close. 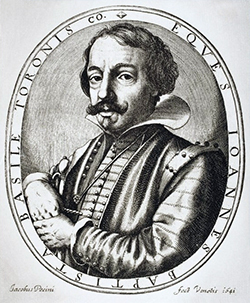 Engraving of Giambattista Basile by Jacobus Pecini, 1641. Collected by Italian poet Giambattista Basile, Stories from the Pentamerone is an obscure fairy tale story assortment that gained new attention after the Brothers Grimm praised it for being the first national collection of fairy tales. “This collection was for a long time the best and richest that had been found by any nation. Not only were the traditions at that time more complete in themselves, but the author had a special talent for collecting them, and besides that an intimate knowledge of the dialect,” said Wilhelm Grimm. Stories from the Pentamerone was actually published posthumously by Basile’s sister in two volumes in 1634 and 1636. As Wilhelm Grimm noted, the Pentamerone doesn’t feature Basile’s interpretations of the fairy tales, but instead, the Italian folk tales are preserved complete with Neapolitan dialects. Basile is believed to have died in 1637.